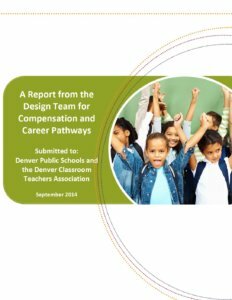 The Design Team for Compensation and Career Pathways is a group of teachers, and school and central office leaders selected by the Denver Public Schools (DPS) and the Denver Classroom Teachers Association (DCTA). They were charged with engaging in a learning process to determine if there were ways to strengthen the compensation, career pathways and related structures to support recruitment and retention of strong teachers and increase career satisfaction and success within DPS. They undertook this process in anticipation of the need to renew the agreement that governs the district’s nationally renowned Professional Compensation System for Teachers (ProComp) as well as upcoming contract negotiations between DPS and DCTA. Over four months the Team met nine times. Its work involved reviewing research studies, examining compensation and career progression examples from other school districts and selected non-education industries, reviewing teacher and principal focus group and survey results, and engaging in deep discussion around design principles and possible frameworks that could be used to strengthen ProCA Report from the Design Team for Compensation and Career Pathwaysomp and career opportunities for teachers. This report is the product of their work.